Institute for Energy Research: Cellulosic ethanol is not yet commercial, but our politicians and the Environmental Protection Agency (EPA) are apparently not aware of that fact since they are mandating U.S. refiners to blend it into petroleum products or pay a fine. Refiners will be required to pay about $6.8 million in penalties for not blending enough cellulosic ethanol into gasoline in 2011. Even though cellulosic producers did not sell a single gallon of cellulosic ethanol commercially in 2010 and it is not clear if they sold any cellulosic ethanol in 2011, EPA has mandated that refiners blend even more cellulosic ethanol in 2012. EPA now requires refiners to blend 8.65 million gallons of cellulosic ethanol or pay EPA millions of dollars in fines. The current system rewards EPA for picking an unrealistic number so that EPA can increase the fines it receives. It also means that consumers will be paying higher gasoline prices. 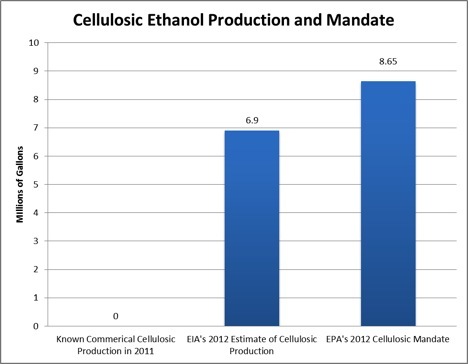 When Congress created the cellulosic ethanol mandate, they assigned EPA the task of determining a new mandate each year, if cellulosic producers do not produce the mandated level. Although the agency provides a much lower mandate than what Congress hoped for, EPA’s mandate is far higher than the amount available from pilot plants and higher than the amount suggested by the Energy Information Administration (EIA). The penalties for not blending the prescribed EPA amount are eventually paid by consumers at the pump. The Energy Independence and Security Act of 2007 (EISA) contains a renewable fuel standard that mandates the production of ethanol to the level of 36 billion gallons by 2022, where 15 billion gallons is to be corn-based and the remainder is to come from advanced forms of biofuels, including cellulosic ethanol. The advanced biofuel contribution starts at 0.6 billion gallons in 2009 increasing to 1.35 billion gallons in 2011, 2.0 billion gallons in 2012 and eventually to 21.0 billion gallons in 2022. Because cellulosic ethanol was not yet commercial, EPA issued changes to the original act that requires four separate standards including 1.0 billion gallons of biomass-based diesel by 2012 and 16 billion gallons of cellulosic biofuels by 2022, subject to annual assessments that EPA will set each November for the following year. The original legislation set the goal for motor fuel from cellulose at 250 million gallons for 2011 and 500 million gallons for 2012. [ii] EPA lowered those figures to 6.6 million gallons for 2011 and 8.65 million gallons for 2012, just a small fraction of the original numbers (about 2 percent), but an incredibly large amount when the cellulosic biofuel does not exist commercially. The Clean Air Act requires the EIA to provide EPA each October with an estimate of the amount of transportation fuel, biomass-based diesel and cellulosic biofuel projected to be available in the following calendar year. EIA’s estimate for 2012 for cellulosic biofuel production is 6.9 million gallons, 20 percent lower than the EPA requirement established for 2012. [iii] To see that even EIA’s lower estimate is high, for 2011, EIA predicted cellulosic biofuel production to be 3.94 million gallons, but “actual sales, if any, are expected to fall well below the estimate” according to the agency. Refiners have to purchase waiver credits for failing to comply with the mandate to purchase cellulosic biofuel that does not exist commercially. For 2011, the cost is estimated at $6.8 million, but the amount will not be determined until refiners close their books in February. According to Charles Drevna, president of the National Petrochemical and Refiners Association, the credits cost about $1.20 per gallon. [vii] These costs are passed onto consumers of gasoline and diesel fuel, so the renewable fuels mandate becomes an invisible tax paid at the gas pump. It is just another way for the federal government to tax consumers, and in this case without most of them suspecting it. Congress subsidized a product (cellulosic biofuel) and mandates its use although that product does not exist and is punishing oil companies for not purchasing the nonexistent product. And the federal government is still subsidizing the industry in the hope that someday it might exist. All along, consumers and taxpayers are paying for the debacle whether at the pump and/or in subsidies and loan guarantees. Tags: ethanol, ethanol mandate, regulations, government refiners, fines for nonexistent Ethanol To share or post to your site, click on "Post Link". Please mention / link to the ARRA News Service. Thanks! by Ken Klukowski: The Pentagon has released a statement confirming that soldiers could be prosecuted for promoting their faith: "Religious proselytization is not permitted within the Department of Defense ... Court martials and non-judicial punishments are decided on a case-by-case basis...”. It’s a matter of what do they mean by "proselytizing." ...I think they’ve got their defintions a little confused. If you’re talking about coercion that’s one thing, but if you’re talking about the free exercise of our faith as individual soldiers, sailors, airmen and marines, especially for the chaplains, they I think the worst thing we can do is stop the ability for a soldier to be able to exercise his faith.”FRC has launched a petition which has already collected over 60,000 signatures, calling on Secretary Hagel is stop working with Weinstein and his anti-Christian organization to develop military policy regarding religious faith. Kenneth Klukowski is is senior legal analyst for and a contributing author to Breitbart News, senior fellow for religious liberty with the Family Research Council and on faculty at Liberty University School of Law. He is a national-bestselling co-author of The Blueprint: Obama’s Plan to Subvert the Constitution and Build an Imperial Presidency and a contributing author to ARRA News Service. 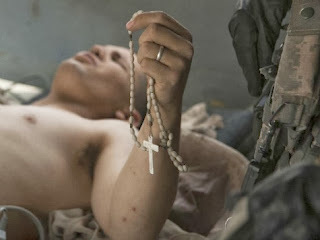 Tags: Ken Klukowski, Pentagon, Court Martial Soldiers, Share, Christian Faith, religious proselytization, Breitbart News, To share or post to your site, click on "Post Link". Please mention / link to the ARRA News Service. Thanks! By Bobby Eberle: Political correctness has simply gone too far. Now, an elementary school in Texas has not only banned any reference to Christmas from its "winter" party, students are not even allowed to wear red or green. What is happening to this country? * Nothing that will stain the carpet.There's just one problem. (Actually, there are MANY problems with this, but let's focus on the legal one.) As Rep. Fallon points out in a letter to the school district, Texas now has what is known as the Merry Christmas Law:The reason for my letter today is to let you know about one of the best new laws that came out of the 83rd Legislative Session. On June 14th of this year, House Bill 308 (nicknamed "The Merry Christmas Bill") was signed into law by Governor Rick Perry and became effective immediately. This law clarifies and codifies the fact that students and district staff are permitted to discuss winter holidays as they please, including using the terms "Merry Christmas," "Happy Hanukkah," or "happy holidays," among others, as greetings. The district may also display scenes or symbols associated with traditional winter holidays (e.g. nativity scenes, Christmas trees, menorahs, etc. ).In addressing the concerns of the angered parent, Fallon wrote that the restrictions placed on the students are "unnecessary, inappropriate, and quite frankly draconian in nature." Fallon added that Texas law "clearly permits Christmas-themed celebrations, events, and displays." Despite the assurances from the district that children would not be banned from referencing Christmas, the rules remain in place. As noted on the Texas Values web site, a second correspondence was sent by a PTA member which states that the rules would remain in place because they "didn’t want to offend any families..."
Hello! I'm offended, and my children don't even go to this school. I'm sure there are plenty of parents who are offended! During this time of year, we are not "celebrating winter." That phrase doesn't even make sense. We are celebrating religious holidays. The parents of those students should speak up and do so now. Rules like this continue to spread, because Americans do not stand up for traditional American values. If it continues, there will be no traditions nor values left. Tags: political incorrectness, elementary school, bans, red and green, Christmas references To share or post to your site, click on "Post Link". Please mention / link to the ARRA News Service. Thanks! by Phyllis Schlafly: Now that America is importing most of the ingredients in our prescription drugs and the majority of the foods we eat, it’s important to look behind the label. It may or may not tell you where the products come from. Researchers did not report the results of animal studies about a drug already being tested in humans, a breach described by drug researchers as a “mortal sin.” Auditors also reported that Chinese workers did not properly monitor clinical trials and they paid hospitals in ways that could be seen as bribery. China’s purchase of pork producer Smithfield Foods Inc. for $4.7 billion has U.S. officials concerned about how this could affect the safety and availability of heparin. That’s an important blood thinner derived from pig intestines that is widely used in U.S. heart surgery and kidney dialysis. This would be the biggest Chinese takeover of a U.S. company. Smithfield is the world’s largest pork producer, with 46,000 employees in 25 states, and is a major supplier of crude heparin, which is already stressed and could soon be in short supply. In 2007 and 2008, nearly 150 people suffered serious reactions and 94 people died after being treated with contaminated heparin. U.S. inspections in China are not what we are used to in the United States. For example, U.S. inspectors came and went from a Walmart-certified factory in Guangdong Province in China this fall, approving its production of specialty items that are on U.S. shelves for Christmas sales. Unknown to the inspectors, none of the kiddie items, such as reindeer suits, were manufactured at the factory being inspected, but had been outsourced to a never-inspected cheaper rogue factory. Pets are in danger, too. Mysterious canine illnesses and deaths have been linked to jerky treats from China, and two manufacturers pulled leading brands off their shelves. Dog lovers are warned that many jerky treats say “product of the USA” but that label merely means they were packaged in the U.S. while the ingredients are Chinese. Federal officials said the current outbreak sickened 3,000 dogs and 10 cats and killed about 600 canines. Chickens raised and slaughtered in China are planned to be on U.S. grocery store shelves next year. The USDA notified China in September that four of its processing plants have been cleared to begin processing chickens from the U.S. and then sell them in the American market. Free trade is bringing us fish raised in China’s sick rivers such as the Yangtze. By the time the fish swim to the fish ponds, the water has accumulated raw sewage, agricultural pesticides, and the heavy metal output of poorly regulated industrial plants. An increasing percentage of vaccines is manufactured in China and sold in U.S. pharmacies. China boasts of 30 vaccine-producing companies that will soon be producing one billion doses a year. China tops the list of countries with tainted products. Chinese baby milk killed Chinese babies after melamine was added to conceal the milk’s low protein count. China has sold Americans a dazzling array of counterfeits and forgeries including copyrighted books, music, and expensive fashion apparel. The China Bee Products Association claims that half of all honey sold in China is fake. China’s latest venture into deception is collecting empty bottles of genuine alcohol, refilling them with a cheap substitute from who knows where, and then reselling this counterfeit alcohol to popular bars and restaurants in Beijing. The police discovered 37,000 bottles of this fake alcohol ready to be delivered. China’s counterfeit alcohol is generally made from one of three bases: ethylene glycol (antifreeze) which attacks the kidneys and heart and is potentially fatal; methanol which attacks the retinal nerve and can result in blindness; and isopropyl (rubbing alcohol). An expert on Chinese health at the Council on Foreign Relations, Yanzhong Huang, explained the big difference between Chinese and U.S. medicine safety. U.S. vaccines are kept safe by supporting institutions such as “the market economy, democracy, media monitoring, civil society, and a business ethics code,” plus inspections and regulations, severe punishment for violators, and lawsuits by trial lawyers. Communist China doesn’t tolerate any of those safety precautions. Tags: Phyllis Schlafly, Eagle Forum, Chinese imports, danger, recalls, To share or post to your site, click on "Post Link". Please mention / link to the ARRA News Service. Thanks! Washington, D.C. – The RSC’s American Health Care Reform Act today reached another milestone by gaining its 117th cosponsor, a majority of House GOP members. Fully repeals President Obama's health care law. Provides tax reform that allows families and individuals to deduct health care costs, just like companies, leveling the playing field and providing all Americans with a standard tax deduction for health insurance. Spurs competition by allowing Americans to purchase health insurance across state lines and enabling small businesses to pool together and get the same buying power as large corporations. Safeguards individuals with pre-existing conditions by bolstering state-based high risk pools and extending HIPAA guaranteed availability protections. More information on H.R. 3121 can be found here. Tags: Republican Study Committee, American Health Care Reform Act, sponsors, majority of Republicans To share or post to your site, click on "Post Link". Please mention / link to the ARRA News Service. Thanks! Tags: Millennials, Repeal Obamacare, Impeach Obama, AF Branco, editorial cartoon To share or post to your site, click on "Post Link". Please mention / link to the ARRA News Service. Thanks! Today in Washington, D.C. - Dec. 6, 2013: Congress not session today, although various committees are working. In an interview, the President commented that he could get more done if his party controlled all of government. What a scary thought. Also, today, President Obama and his family turned the lights on on the National Christmas tree. The Department of Labor’s unemployment report for November 2013 was released today. House Speaker John Boehner (R-OH) responded to the report, "Today’s report includes positive signs that should discourage calls for more emergency government ‘stimulus.’ Instead, what our economy needs is more pro-growth solutions that get government out of the way. That’s why the House has passed dozens of jobs bills that would help small businesses hire, increase our energy production, rein in red tape, and protect all Americans from the fundamentally-flawed health care law. President Obama ought to take this opportunity Republicans have given him and call on his party’s leaders in the Senate to act on these proposals immediately." Evan Feinberg, President of Generation Opportunity said, "The economy has been terrible for young people for five years now, and President Obama has responded by asking my generation to foot the bill for more government spending and pay more for healthcare coverage through Obamacare. Thankfully young people know a bad deal when we see one and are overwhelmingly choosing to Opt Out of Obamacare, opposing generational theft. This disastrous healthcare law has finally caught up with the President and his approval rating among young people is collapsing alongside Obamacare itself." The declining labor force participation rate has created an additional 1.844 million young adults that are not counted as “unemployed” by the U.S. Department of Labor because they are not in the labor force, meaning that those young people have given up looking for work due to the lack of jobs. The effective (U-6) unemployment rate for 18-29 year olds, which adjusts for labor force participation by including those who have given up looking for work, is 15.9 percent (NSA). 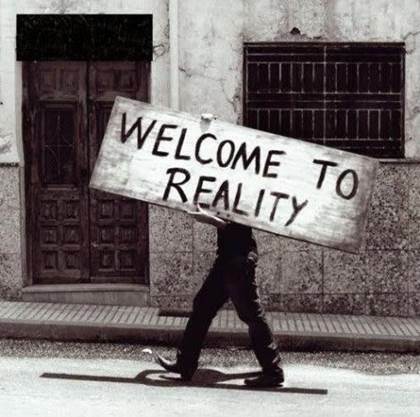 The (U-3) unemployment rate for 18-29 year olds is 10.0 percent (NSA). The effective (U-6) unemployment rate for 18-29 year old African-Americans is 24.4 percent (NSA); the (U-3) unemployment rate is 17.9 percent (NSA). The effective (U-6) unemployment rate for 18-29 year old Hispanics is 16.9 percent (NSA); the (U-3) unemployment rate is 10.9 percent (NSA). The effective (U-6) unemployment rate for 18-29 year old women is 13.8 percent (NSA); the (U-3) unemployment rate is 9.5 percent (NSA). But who knows if the BLS data is accurate? Recent revelations that previous data was in error, possibly manipulated for political purposes, and then later revised makes us wonder. Just three days ago, on Dec. 3, House committee chairmen sent a letter to the Secretary of Labor requesting information relevant to their investigation into allegations that unemployment numbers have been manipulated at the Bureau of Labor Statistics and the Census Bureau. Americans for Limited Government vice president of public policy and communications Rick Manning, a former Public Affairs Chief of Staff at the U.S. Department of Labor, today issued the following statement praising the action by these House committee chairmen: "The House Education and Workforce Committee and the Ways and Means Committee have taken a vital first step in getting answers from Labor Secretary Thomas Perez on news reports that monthly jobs data has been manipulated. "In the context of ongoing legitimate concerns that the unemployment numbers have been willfully and deliberately manipulated, the Labor Department's report that the unemployment rate has dramatically declined to 7 percent is evidence that it is now time for Congress to end extended unemployment benefits and restore the normal 27 week eligibility period that existed prior to 2008. Only 3 out of 10 young Americans (18-29) plan to enroll in the government exchanges. 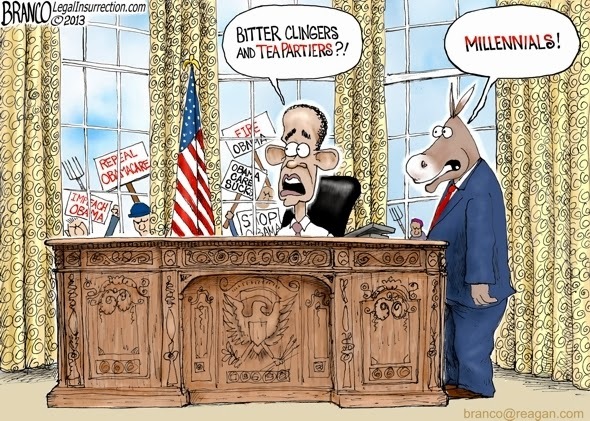 57% of Millennials disapprove of Obamacare. Only 18% say Obamacare will improve their care. If a recall election were held today 52% of young Americans 18-24 would vote to recall President Obama. Tags: Gallup, poll, Harvard poll, Obamacare, problems, Labor Department, unemployment, Millennials, To share or post to your site, click on "Post Link". Please mention / link to the ARRA News Service. Thanks! by Herman Cain: The Empowering Patients First Act. Barack Obama doesn't only lie about his illegal alien uncle. He also lies when he stands there time after time and insists Republicans have offered no alternative to ObamaCare. In fact, Republicans have offered many alternatives to ObamaCare, and one of the best comes from Congressman Tom Price, who is from my state of Georgia and is also a physician. Known as the Empowering Patients First Act, Tom's bill is H.R. 2300 and would save taxpayers $2.34 trillion over its first 10 years according to an analysis from Douglas Holtz-Eakin, the former head of the Congressional Budget Office. It extends tax deductions for health insurance to those who buy as individuals, thus eliminating the perverse incentive that favored employer-purchased insurance. It gives patients true portability by making them the owners of their insurance – not their employers. It gives doctors the real power to make treatment decisions, not insurance companies or the government. It reforms medical liability laws and thus saves money by reducing the practice of defensive medicine. Tom knows of what he speaks when he warns that many of his former colleagues in the medical profession are looking to get out of the profession entirely because the economics of ObamaCare simply make it impossible for them to practice. But Tom's bill is not about physicians so much as it is about empowering you, the patient, to make decisions about your own health care and to have the economic freedom and wherewithal to pay for it. The premise of ObamaCare is that everyone should accept the insurance the government wants them to have, because they think that's what makes the system work. As we have already seen, the system doesn't work at all. The premise of the Empowering Patients First Act is that you should be able to choose what kind of coverage you want, and where you get it. That's the alternative to ObamaCare, and I guess it's no surprise Obama doesn't want you to know about it. But now you do. Tell everyone. Herman Cain is an American author, a business executive including being chairman and CEO of Godfather's Pizza for ten years and the CEO of the National Restaurant Association and serving on the Kemp Commission and as senior economic advisor to the Bob Dole presidential campaign, aradio host, a syndicated columnist, and A Tea Party activist from Georgia. He was a candidate for the 2012 U.S. Republican Party presidential nomination. He furst shared this commentary on the Best of Cain. Tags: Herman Cain, Obamacare, alternative, Tom Price To share or post to your site, click on "Post Link". Please mention / link to the ARRA News Service. Thanks! 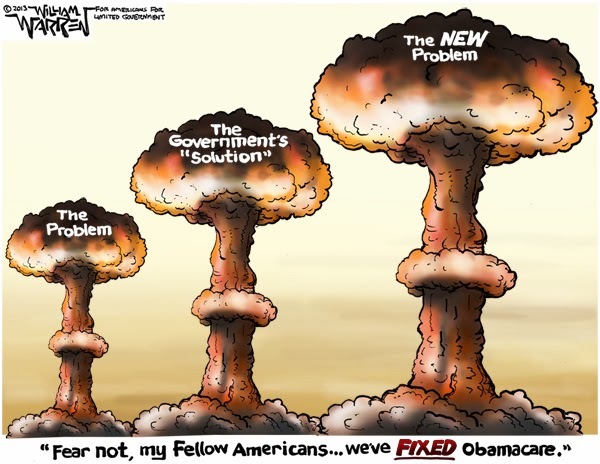 Tags: Government Solution, fixing Obamacare, editorial cartoon, William Warren To share or post to your site, click on "Post Link". Please mention / link to the ARRA News Service. Thanks! Seton Motley, Contributing Author: Our cell phones are chewing up more and more spectrum - so the cell phone companies need more and more of it to keep us productive and happy. Thus there will be in our future a government-run two-pronged spectrum incentive auction - to get more of it to market. Prong One: The nation’s broadcasters can if they wish sell to the government some or all of their spectrum. Prong Two: The government will then hold an auction to sell said spectrum to the nation’s wireless phone providers. T’would be far better if the government hadn’t inserted itself as a middle man - and the broadcasters could simply organize with the wireless phone providers a secondary-market auction. But why do things simply and efficiently? This is Washington, after all. The government wants its money cut - which it could have had without being the go-between. What the government couldn’t do as an innocent bystander is mess around with how the auction is conducted. Herein lies the potential problem.Some Media Marxist groups are demanding that the government prevent AT&T and Verizon from openly bidding on any spectrum they wish. Why? Because these Leftists have deemed these two to be too successful – and they want the government to spread the wealth around. Spread it to whom? Everyone else besides AT&T and Verizon. Well, Sprint is #3 in the nation. They too want the government to Crony Socialize the auction. To their direct benefit - every time the Feds block AT&T and Verizon from bidding, it makes it easier and cheaper for Sprint (and everyone else).Sprint is pushing this nonsense because they are trying to use government to hobble their competition. If you can’t beat them in the free market, have the Leviathan beat them with a regulatory bat. The underlying theme throughout is the advancement of as much government as possible - all the while as much as possible disrupting the free market and destroying or silencing those opposed. Under the fraudulent guise of advancing the “public interest.” By which they of course mean government interest. After all, Media Marxists are...Marxists. And growing the government interest is what they do.The Media Marxists say they want the government messing with the auction to prevent a monopoly. Or a duopoly. Or something. Except besides AT&T and Verizon there’s Sprint. And T-Mobile. And U.S. Cellular. And Leap Wireless. And Boost Mobile. And Cricket. And many, many others. Not exactly a dearth of selections - certainly not a duoply. This is very simple. You either want an actual auction - where as many people can bid as much as they want on whatever they want. Or you want a government-pick-losers-at-the-expense-of-winners, Crony Socialist nightmare mess. And - brace yourself - look who wants the free market: New York Democrat Senator Chuck Schumer. That is why I urge you, in structuring these auctions, to maximize participation by broadcasters and bidders alike by avoiding limitations that could lower the potential return and disincentivize broadcasters from offering their spectrum for auction. While I understand that some have advocated for rules that would limit participation by some wireless carriers, the effect of such rules would simply be to reduce the amount of spectrum offered for auction as well as the revenue that would be generated in return.Bravura, Senator. If only you’d apply this reasoned reasonable-ness to all things private sector, we’d be really getting somewhere. Justice Department Wants to Limit Major Telcos’ Involvement in Spectrum AuctionsHere’s hoping newly-minted Obama Administration Federal Communications Commission (FCC) Chairman Tom Wheeler - the man ultimately responsible for setting the spectrum auction rules - sides with Senator Schumer, the free market, results and Reality. And against government micromanagement of yet another facet of the private sector. Seton Motley is the President of Less Government and he contributes to ARRA News Service. Human Events also published this article. Please feel free to follow him on Twitter Facebook. Tags: wireless phones, broadcasters, technology, the future, Marxism, Media Marxist groups, Chuck Schumer, Seton Motley, Less Government To share or post to your site, click on "Post Link". Please mention / link to the ARRA News Service. Thanks! Alan Caruba, Contributing Author Living on planet Earth these days is much like living on the edge of a volcano that can erupt at any time and which rumbles ominously all the time. After three decades in which the United Nations and countless “environmental” organizations have tried to convince everyone that “global warming” and then “climate change” (the rebranding that occurred when the former reversed itself into a cooling cycle) was occurring, the effort to use this hoax to redistribute wealth from developed to undeveloped nations is pretty much at an end. Meanwhile, billions have been squandered at home and in other nations on “renewable energy” and all manner of “research”, largely based on phony computer models, complete with claims of a “consensus” that never existed. 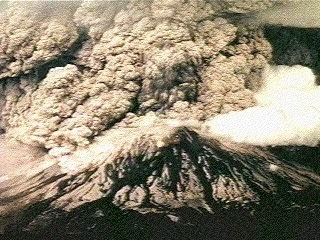 Every so often a volcano erupts and the people are told to evacuate. Only, on planet Earth, there is no place to run because the systems developed to move money around are so rigged and so flawed that the systems are now in serious trouble. It portends default and collapse, something that nations try to avoid but which occur with regularity, along with recessions. The present example is the printing of money backed by nothing more than the "full faith and credit of the United States" by the U.S. Federal Reserve bank which it then uses to purchase U.S. debt. The United States is a volcano whose many social programs, all devoted to the redistribution of wealth by the government, are reaching a point of such an eruption; insolvency. Their need for reform is widely known, but there is no political will to make such reforms. Meanwhile, the Obama administration keeps expanding them in the form of disability payments, food stamps, and, of course, Obamacare, the takeover of one sixth of the nation’s economy. It is such a huge disaster that no one can ignore it. The only solution is to repeal the law, but that is not going to happen for at least three more years while an incompetent narcissist and pathological liar remains in office. The progressive agenda is being pressed by the Democratic Party which is now just another name for the Communist Party. As if problems at home were not so serious, the efforts of the President to downsize America’s role in the world is causing other nations to sense weakness and, of course, seek to take advantage of it. China, whose landmass is 3,705,407 square miles, has recently announced that it wants to expand its territorial outreach to include some islands that Japan has long maintained as part of its territory. The response has largely been tepid at this point, but if China’s claims are granted, it will expand on them. Treaties in effect would require the U.S. to go to war to defend Japan’s interests. Other global problems include the expansion of Islamic fascism beyond the Middle East to include a more vigorous effort in North Africa, the sub-Sahara, and other nations to include Somalia. The threat is manifest enough for Muslim nations to engage in the effort to eliminate groups like the stateless al Qaeda. In recent times, some nations have seen the overthrow of dictators who have plundered them. They include Egypt, Libya, and Tunisia. In some cases this has created opportunities for the Islamists. Egypt has responded by outlawing the Muslim Brotherhood. The threat of a nuclear-armed Iran has just increased by several factors when the United States led a group of European nations, plus Russia and China, in an effort to stop resisting Iran in favor of opening up its economy to various business deals that the sanctions imposed by the United Nations have deterred. It’s short-term self-interest versus a predictable nuclear holocaust. Previous efforts with North Korea failed. Largely unknown to the world’s population is the way globalization has put every nation at risk should any of the world’s nations default on their debt. This has happened in the past, but not in the way a future default—particularly by the United States—would plunge the world into a financial crisis that no one can even imagine. The U.S. is already seriously in debt with a gross domestic product (GDP)of some $14 trillion annually versus debt of various descriptions that range from $17 trillion in borrowed money to many trillions more in “unfunded” debt in the form of its social programs in which the U.S. collects money from its employed population and redistributes it to those unemployed. Unfunded obligations are now estimated to be around 90 trillion dollars. The so-called “trusts” of these programs is a fiction. The federal government has used that money to pay its on-going debts. The current actual and estimated debt will affect the lives of today’s children, grandchildren, and future generations. It will take a hundred years to dig out from such debt. U.S. budgets do not reflect “events” that can and will occur such as natural disasters. Wars break out when one least expects them. 9/11 was such an event. It drained ten trillion dollars from the economy. The various Wall Street “bubbles” collapse. The budgets are in many ways works of fiction. The largest population the Earth has ever known, seven billion and growing, is perhaps the biggest volcano of all. Much of the population continues to live in actual or relative poverty. Much of it is aging at the same time fertility rates worldwide decline. Intellectuals keep calling for reducing the population by allowing as many as possible to die by denying them medical care. Vast numbers of the population are voting with their feet. They migrate to wherever jobs and more freedom exist. The U.S. has not secured its southern border. Europe is under siege by migration from the Middle East and Africa. The volcanoes of population and weakened economies are rumbling louder these days. Tags: global issues, national issues, living on the edge, risks, changes, Democrats, communist party, Alan Caruba, Warning Signs To share or post to your site, click on "Post Link". Please mention / link to the ARRA News Service. Thanks! If the government can force you to buy health care, they can force you to buy a boat....or ANYTHING else. Makes one wonder where the "Supreme Court Judges" had their heads when the majority ruled that a non-tax was a tax, and we could be made to buy healthcare under the Affordable Care Act, aka, Obmacare. 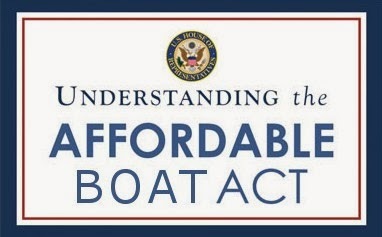 The U.S. government has just passed a new law called: "The affordable boat act" declaring that every citizen MUST purchase a new boat, by April 2014. These "affordable" boats will cost an average of $54,000-$155,000 each. This does not include taxes, trailers, towing fees, licensing and registration fees, fuel, docking and storage fees, maintenance or repair costs. This law has been passed, because until now, typically only wealthy and financially responsible people have been able to purchase boats. This new laws ensures that every American can now have a "affordable" boat of their own, because everyone is "entitled" to a new boat. If you purchase your boat before the end of the year, you will receive 4 "free" life jackets; not including monthly usage fees. In order to make sure everyone purchases an affordable boat, the costs of owning a boat will increase on average of 250-400% per year. This way, wealthy people will pay more for something that other people don't want or can't afford to maintain. But to be fair, people who cant afford to maintain their boat will be regularly fined and children (under the age of 26) can use their parents boats to party on until they turn 27; then must purchase their own boat. If you already have a boat, you can keep yours (just kidding; no you can't). If you don't want or don't need a boat, you are required to buy one anyhow. If you refuse to buy one or cant afford one, you will be regularly fined $800 until you purchase one or face imprisonment. A government review board (that doesn't know the difference between the port, starboard or stern of a boat) will decide everything, including; when, where, how often and for what purposes you can use your boat along with how many people can ride your boat and determine if one is too old or not healthy enough to be able to use their boat. They will also decide if your boat has out lived its usefulness or if you must purchase specific accessories,(like a $500 compass) or a newer and more expensive boat. Government officials are exempt from this new law. If they want a boat, they and their families can obtain boats free, at the expense of tax payers. Unions, bankers and mega companies with large political affiliations ($$$) are also exempt. If the government can force you to buy health care, they can force you to buy a boat .... or ANYTHING else ... Yea... it's that stupid. Tags: obamacare, affordable healthcare act, affordable boat act, socialist, democrats, Government theft, loss of freedom, parody To share or post to your site, click on "Post Link". Please mention / link to the ARRA News Service. Thanks! by Eric Boehm: Americans who buy health insurance through the federal Obamacare exchange website could have their personal information stolen by hackers and never even know it. Most of the state-run health exchange websites will be covered by state laws that require notification when government databases are breached by hackers. But there is no law requiring notification when databases run by the federal government are breached, and even though the Department of Health and Human Services was asked to include a notification provision in the rules being drawn up for the new federal exchange, it declined to do so. Other protections for individuals’ privacy, like the Health Insurance Portability and Accountability Act, or HIPAA, do not apply to the government-run exchange, only to health providers and insurance companies operating within the exchange. Privacy advocates and cyber-security experts have had concerns about the lack of a federal notification law for years and hope the scrutiny of the Obamacare exchange will finally bringchange. The lack of a notification requirement is particularly bad for the health insurance exchange website because of all the questions surrounding the site’s security. Poor security, coupled with the website’s high-profile problems, could make it a target for hackers either seeking to steal identities or embarrass the government. Unfortunately, security is often an afterthought for the government, said David Kennedy, CEO of TrustedSEC, an Ohio-based cyber-security firm. Kennedy has testified before Congress about security threats in the Obamacare exchange and the need for notification laws. Together it creates a possible nightmare scenario. Without strong security on the front end, the hastily built and not fully operational website could become a treasure trove for hackers looking to steal identities. But without any laws requiring that those victims be notified by the federal government users of the Federal health exchange will be in the dark about any potential security breaches of their private data. When the federal Obamacare exchange was being developed by HHS prior to its troubled launch on Oct. 1, experts told the department that it should include a data-breach provision in its policies for the website even though one was not required under federal law. fanfare, but security remains a concern. The department flatly declined to do so. The final rules for the exchanges were approved on March 27, 2012, meeting of HHS officials, according to the Federal Register. At that meeting, two commenters asked HHS to ensure the exchanges would promptly notify affected enrollees in the event of a data breach or unauthorized access to the exchange’s databases. One suggested that a full investigation be launched each time such a breach occurred, with the goal of holding hackers legally and financially accountable for breaking into the website. Since there is no federal notification requirement, breaches of any and all federal databases can occur without the public ever being informed. The only way to find out a hack has occurred is when the government decides to disclose it — as several federal law enforcement agencies did last month in response to attacks from Anonymous, a group of super-hackers who threatened to take down the FBI website and others. But hacks that happen behind the scenes —potentially stealing everything from Social Security numbers to Department of Homeland Security watch lists — never have to be reported. Federal privacy protections contained in HIPAA also do not apply to the databases created by the federal exchange website, McGraw said, even though health insurers doing business through the exchange must be HIPAA compliant. In other words, the health plan itself is covered by HIPAA and any breaches of security that affect a consumer who has purchased a specific plan would have to be reported. But the process of choosing and purchasing a plan through the federal exchange — along with any information entered into the federal exchange as part of that process — is not subject to HIPAA protections. “The problem with the exchanges is that they are such new entities, and they are so unique that existing laws don’t really cover them,” McGraw said. But 48 states have laws on the books requiring that they give notification to individuals who may have had personal information stolen or leaked from a government database. Many states require that government agencies and departments alert the state attorney general so investigations can be launched. In states that opted to run their own health insurance exchanges, those laws generally cover security breaches of the exchanges, McGraw said, though it depends on the specific wording of each state law. Those state laws are how data breaches of several state-level health insurance exchange websites have come to light. for Minnesota’s health care exchange. In September, Watchdog.org reported on a data breech of the Minnesota health exchange — known as “MNsure” — that potentially affected as many as 2,400 people. In Florida, concerns about data breaches of the state-run exchange website prompted Gov. Rick Scott to send a letter to Congress saying Floridians would not exchange privacy for insurance. On the federal exchange, such breaches are possible, maybe even likely, since the site was launched without comprehensive testing of the security controls for the system. A Sept. 27 memo to Medicare chief Marylin Tavernner said insufficient testing of the website before the Oct. 1 launch “exposed a level of uncertainty that can be deemed a high risk,” the Associated Press reported in October. Even though the federal government does not have to report any breaches of security, at least a few already have occurred. The most high-profile case so far is that of Thomas Dougall, a South Carolina lawyer who had his personal information accidentally leaked to another person after using the Obamacare exchange last month. Dougall only found out about that breach of security because the recipient was kind enough to give him a call. Without a requirement that the exchanges report such problems — whether the result of nefarious hackers or glitches in the programming — it is impossible to tell how many other Americans have had their private information released by the federal exchange. Kennedy said he would not recommend that anyone use the federal exchange until it is more secure and until breaches of security are reported. “I would say think twice about it, at least until we get more details,” he said. Kennedy says he supports universal health care and his criticisms of the website are not rooted in political motivations. But the former U.S. Marine whose firm provides computer security to several Fortune 100 companies says there have been “zero changes” to the security of the health insurance exchange website in the run-up to the much-touted Dec. 1 re-launch. Congress has debated a federal notification law in each of the past three years, but one has never been passed. In July, during a hearing of the House Committee on Energy and Commerce, lawmakers heard testimony from a variety of experts who explained the need for a federal breach notification requirement. David Thaw, a law professor at the University of Connecticut who specializes in cyber-security and the legal framework around it, said data breach notification laws, combined with comprehensive data security, are an essential part of protecting consumers and businesses. “I analogize the effects of breach notification alone to locking the bank or vault door while leaving a back window wide open,” he said. With the federal health insurance exchange, there are questions about whether the vault door has been adequately locked. But there is no doubt that the back window is still wide open. Tags: security breaches, Obamacare Exchange, website, Feds not reporting, Watchdog, Eric Boehm To share or post to your site, click on "Post Link". Please mention / link to the ARRA News Service. Thanks! Tags: Obamacare costs, real storyINSERT TAGS To share or post to your site, click on "Post Link". Please mention / link to the ARRA News Service. Thanks!